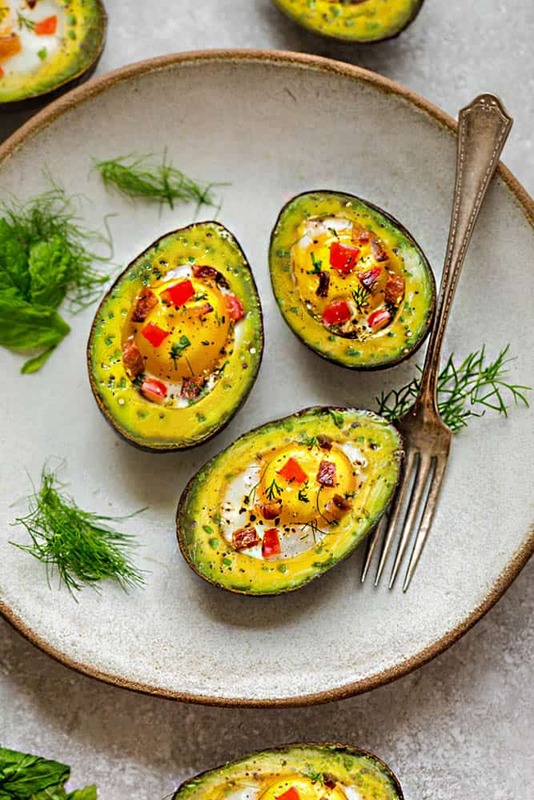 Avocado Egg Cups baked with crispy bacon and bell pepper are a super healthy and easy breakfast to start the day. Best of all, this simple recipe comes together in less than 30 minutes. Low carb, keto and paleo friendly. Avocado and eggs for breakfast happen daily around here. They are packed with loads of nutrients, vitamins and heart healthy fats. 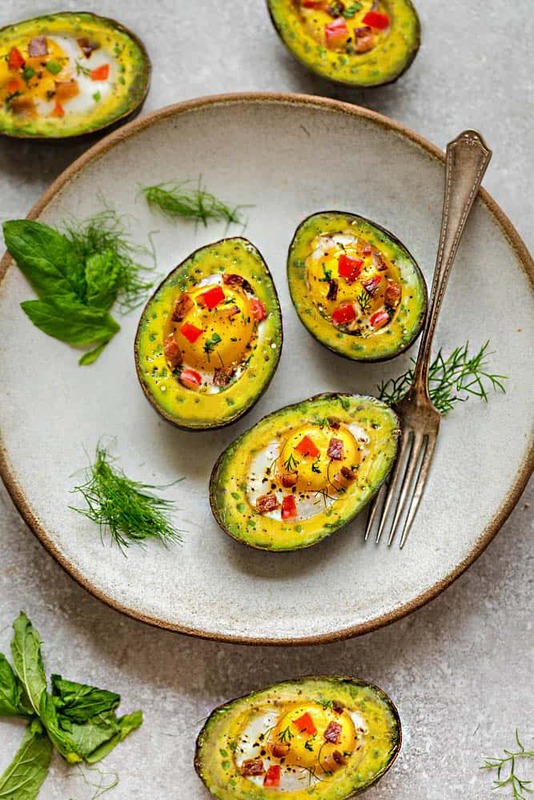 My daughter and I are huge egg and avocado fans and love adding our own spins to the many stuffed avocados you see everywhere now. Taco Stuffed Avocados, Enchilada Stuffed Avocado and now these Baked Avocado Egg Cups for breakfast. They are a super fun way to enjoy the best of both worlds. 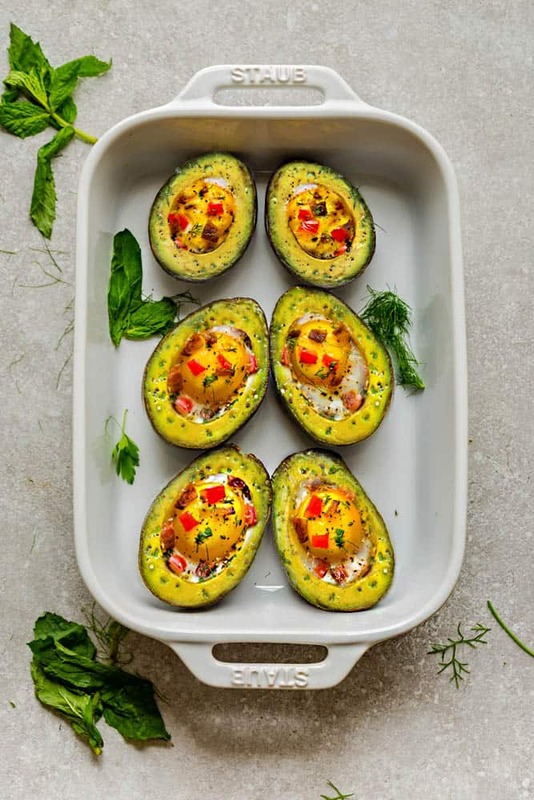 If you’re a fan of a runny yolk in a velvety roasted avocado, then these baked avocado cups are definitely for you. 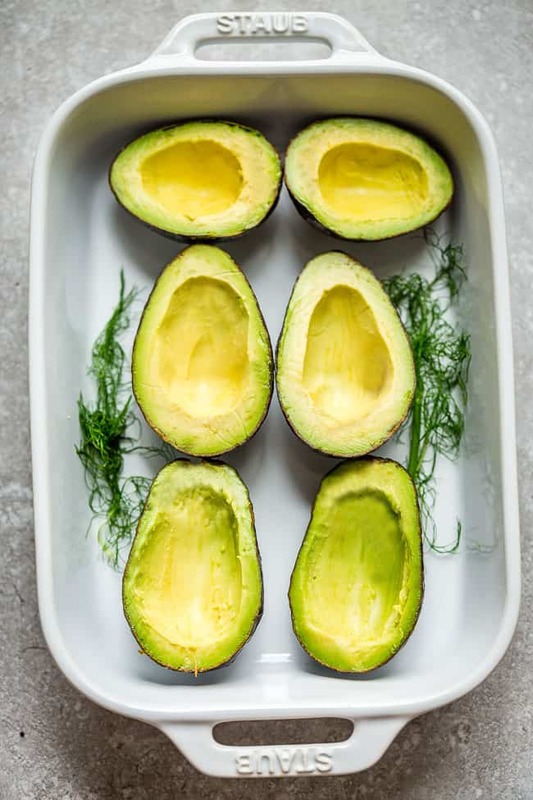 You bake the avocado boats for only about 10-12 minutes, until the whites have set and they come out warm and creamy with a slight smoky flavor. You can serve them for breakfast just as they are or along with some low carb muffins or some paelo or keto toast. Start by cutting your avocados in half and remove the stones. Scoop out about a tablespoon or more of the flesh in each half so you have a larger hole to hold the egg. To avoid your avocado halves from rolling and tipping over, be sure to position them against each other or wedge a small ramekin for support. If you are using a baking dish or a sheet pan, be sure to line it with foil or parchment paper for easier clean up. Crack an egg into the the pit of the avocado. Sprinkle with a dash of salt, pepper, and any seasonings you like – you can always add more later when they come out of the oven. Bake at 400°F for around 12 to 15 minutes – just until your egg whites set but the yolks are still a bit runny. Keep a close eye on them to avoid overcooking. You can also whisk the eggs first and then pour into the avocado halves if you’re not a fan of runny yolks. Add any other toppings or condiments you like after these come out of the oven, and enjoy! 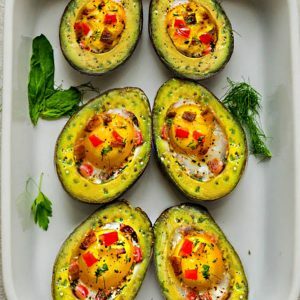 HOW LONG SHOULD I COOK THESE AVOCADO BOATS FOR? If you like your yolks less runny and soft, you can increase the baking time to 14 to 16 minutes and 15 to 18 minutes if you prefer hard-cooked yolks. WHAT TOPPINGS CAN I ADD? Top the egg cups with some crispy bacon and you’ve got one complete and delicious and healthy breakfast. If you’re not a fan of bacon, some chopped ham, crumbled sausage along side a slice of fresh toast would also be amazing. To give these egg boats a little more color, I topped mine with some fresh herbs and chopped bell peppers and spinach. You can also add some diced tomatoes, kale or mushrooms as well. ARE ROASTED AVOCADO BOATS HEALTHY? 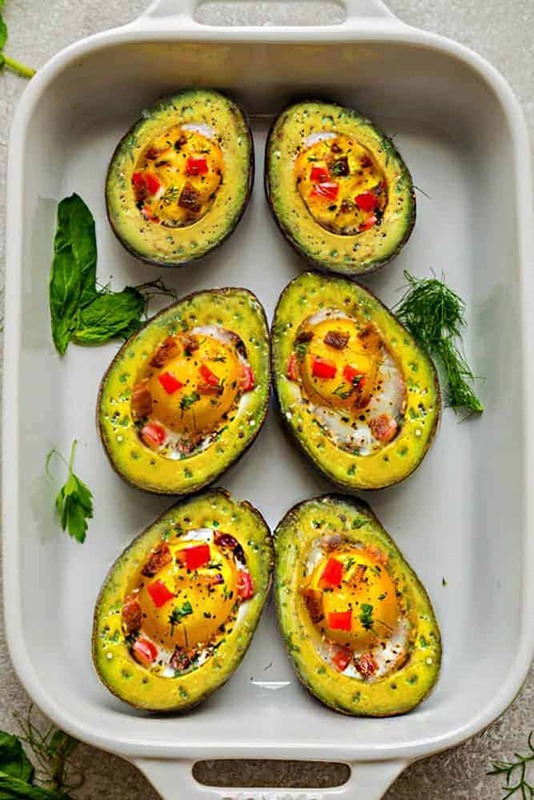 Baked Avocado Cups are not only full of healthy fats, they’re paleo friendly, these ones are also low in carbs, ketogenic friendly and if you use sugar free bacon (or leave it out) they’re also Whole 30 compliant. Line a baking sheet or baking pan with foil or parchment paper (for easier cleanup). 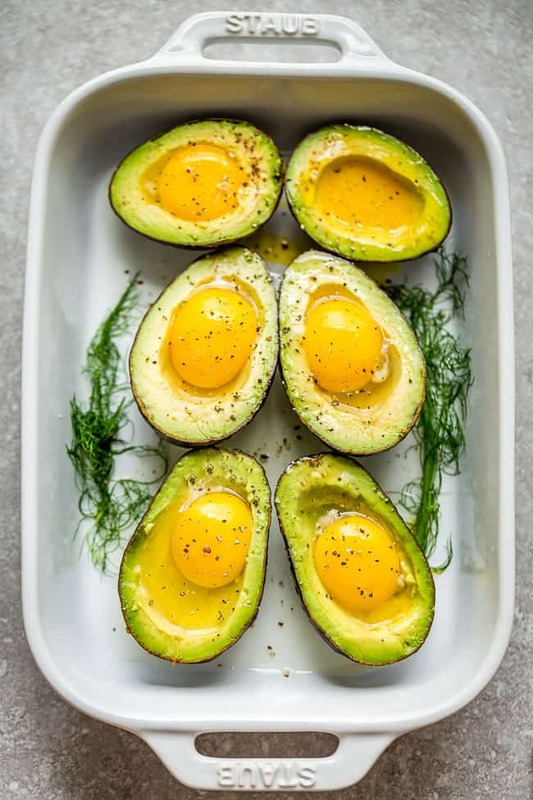 Cut avocados in half and scoop an additional 1-2 tablespoons of the avocado flesh out to create a larger nest for the eggs. Position the avocado halves propped against the baking dish or touching the other avocados snugly to avoid spilling over. You can also place a small ramekin and prop them against the avocados. Gently crack one egg in each avocado half - if needed - save some of the egg whites in another bowl if the avocado well is too small. Bake for 13-18 minutes, or until the whites are set and the egg yolks are cooked to your liking. Top with crispy bacon, chopped red bell pepper, spinach and fresh herbs. Serve immediately.